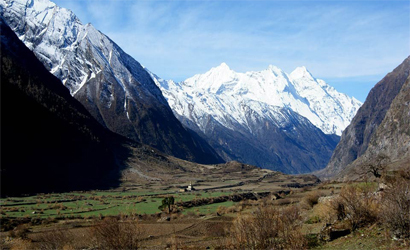 Many people combine the Tsum Valley with the Manaslu Circuit starting in Arughat Bazaar and ending in Besisahar. Besisahar is also the starting point for the Annapurna circuit. The trail starts low, passing through lush green countryside and small Hindu villages. Trek to this valley is a journey through the off beaten trail that adorns natural beauty in its original attire. As you open up to the valley, you can see the stunning views of mountains like Ganesh Himal, Sringeri Mountain, and Boudha Mountain. This trek is also an opportunity to be at the base camp of Ganesh Himal. From the base camp, you can see the beautiful views of other mountains too. See more. 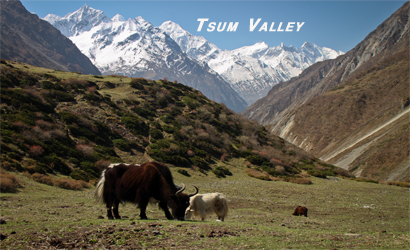 Many people combine the Tsum Valley with the Manaslu Circuit starting in Arughat Bazaar and ending in Besisahar. Besisahar is also the starting point for the Annapurna circuit. The trail starts low, passing through lush green countryside and small Hindu villages. You enter Tsum Valley from the main trail and will soon find yourself in beautiful pine and rhododendron forests. Heading east the valley opens up to reveal beautiful landscapes and small Tibetan-style villages. There are basic guesthouses all along the trail so you can choose if you want to camp or stay at the teahouses/guesthouses. Initially, our trip starts from Kathmandu. We cruise down to Arughat. But our trekking starts and ends from Arughat. We cross half of the route by the banks of Budi Gandaki River. The elegant views of beautiful forest, terraced fields and hilly villages can be seen hiking beside the Budi Gandaki River. In addition, the path goes through alpine forest, pristine glacial rivers and warm friendly peoples. Passing through Machhakhola, Jagat and Philim and other beautiful vibrant villages we reach the gorgeous Tsum valley where we can enjoy its natural beauty. On our way back, we follow the same path to return to Kathmandu. Spectacular views of Mt. Ganesh and Manaslu mountains. In Arughat (600m), a pleasant market town straddling the Budi Gandaki River cross the suspension bridge and stay overnight at Lodge. Trek through Gurung and Magar villages staying on the left bank of the Budi Gandaki, which you will be following to its source. Climb on stairs as the valley becomes wilder, prettier and narrower and descend to Soti Khola (710m). There’s a swimming hole in the Soti Khola, popular with locals. Trek on through shady Sal forests then climb up and down for some time an exposed track blasted from the cliff and views way below of wild rapids, descending to Labubesi (880m. Starting our trail from Khorlabesi on the ridges to Tatopani crossing the Budi Gandaki emerge onto river flats for some rest at Yaru (1140m). Crossing to the left bank with easy up and down we reach to Jagat, a neatly Flag stoned Gurung village. We start our trail over a rocky ridge to Salleri, after completing with the ACAP procedure and then we descend to Sirdibas. The valley widens a bit as the trail continues up to Philim, a large gurung village. Walking past Philim to the north across a forest with the views of the narrowing valley we reach Chisopani. We cross the suspension bridge onto the opposite bank with the great views of Ganesh Himal crossing bridge we arrive at the Gho Village. Continues climb to Tsum takes us to the village of Chhokangparo. We walk to the west bank of the valley through the Tibetan landscapes to the Mu Gompa. We also visit the monastery. Then after, we make a visit to the Dhephu Doma Gompa. 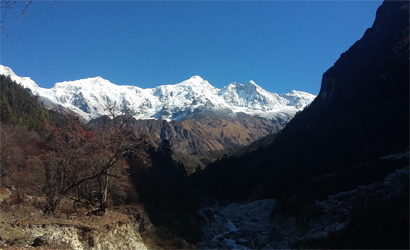 Trek back through Chhule and Phurbe, on the east bank of the Shiar Khola.Climbing up to the Milarepa's Cave Milarepa Cave (piren phu) is known for its mesmerizing glimpses of Poshyop Glacier, Kipu Himal and Churke himal.Passing Cave we arrive at Burgi village, a small beautiful village. We descend down to Chhokang Paro watching the beauty of nature. From their we continue descending to Gho further more descend we arrive at the bridge over the Sarpu Khola. Trekking along the lower Tsum Valley takes you to again Chumling. The trail continues to Lokpa on a flat trail we move ahead with gorgeous Samba Falls. Finally arrive at Philim a trail passes through the Phillim village that leads to the Ganesh Himal Base Camp. Trek starts descending down to Sirdibas from Philim to Khorlabesi via Jagat and Tatopani a hot spring. If interested, you may dip yourself in the hot spring and relax your tired muscles by soaking yourself in the hot spring. If not continue walking up and down from Tatopani to reach Khorlabesi. We start our journy back to Kathmandu from Soti Khola via Arughar along the banks of the Budi Gandaki, Marsyangdi and Trishuli rivers with splendid views of green hills, mountains, farming terraces and villages on both sides of the road. To celebrate the successful completion of our journey, we will have a farewell dinner in the evening.